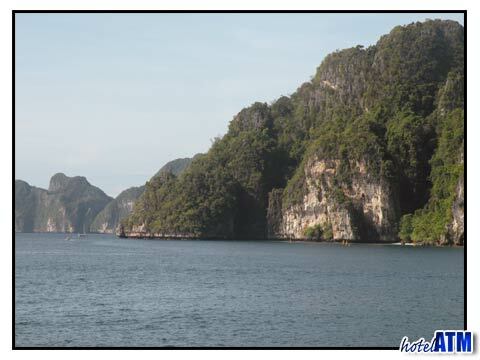 Getting from Phi Phi to Phuket can be done on the standard ferries or speedboat transfers. This trip is mainly for people who have spent some time on Koh Phi Phi but for others it is the scenic route from Krabi to Phuket. The Phi Phi to Phuket ferry service run twice a day from Koh Phi Phi pier in the main village and gets you to Rasada Pier in the south east of Phuket island just 5 minutes from Phuket Town. The route takes you out of the pretty Tonsai Bay, through the gap between the Phi Phi Don and Phi Phi Ley cliffs and mountains and then heads west. The scenery is a wonderful mixture of islands and sheer rock faces all set on a deep blue sea. As you go out onto the sea you past Koh Doc Mai, Koh Maiton and see Koh Yao and get the contours of the beautiful Phang Nga Bay to the north. As the afternoon boat approaches Phuket, the sun starts to give off that evening glow to add to the sense of a memorable ferry trip. The Phi Phi to Phuket timetable shows that the ferries leave at 9.00am and 2.30pm. The 9.00am ferry is smaller than the afternoon ferry. It is mainly for the local traders who wish to go to Phuket to buy goods in the morning and then return on the afternoon ferry from Phuket. The afternoon ferry is the large cruise boat that is the return for the One day snorkel tour Phuket to Phi Phi. Phi Phi to Phuket Airport makes the ferry trip to Phuket a critical event. If you get the 9.00am ferry you can't expect to make a plane earlier than 12.30pm as you need to take a 50 minute transfer by bus or taxi to the north of the island as Phuket airport is near Nai Yang beach. Likewise a 2.30 pm Phi Phi to Phuket ferry means you shouldn't expect to get a plane before 6.30 pm. Some people need to stay near the airport and the Phuket Airport hotels link might be useful. For many who are staying on the western beaches of Phuket like Patong Beach, Karon Beach and Bang Tao Beach, you will need a further transfer to your new hotel. The Phi Phi to Phuket ferries are met at Rasada pier by taxis and shared mini buses. Typically Patong is 40 minutes from the pier, Karon Beach 45 minutes and Bang Tao 50 minutes. All these beach destinations face the west and enjoy absorbing sunsets. Patong is the night life capital of the island, Karon is quieter and Bang Tao has a reputation for luxury resort. Some passengers use the Phi Phi to Phuket ferry as part of an island hopping experience. Instead of driving around Phang Nga Bay many prefer the Krabi to Phuket cruise. This all day process can start at 8.30 am from Ao Nang and get you to Phuket at 4.30 pm. The drive is spectacular and takes 2 hours but why bother when you can enjoy the sea.